New York, Feb 18 (IANS) In an unusual gesture, Alabama Governor Robert Bentley issued a public apology for the attack by police on an Indian man that left him partially paralysed. “Please accept our sincere apology for this tragic incident to your government, (Sureshbhai) Patel and the citizens of India who live and work in this state,” the Republican governor wrote in a letter to Ajit Kumar, the Indian consul general in Atlanta. The letter was publicised by Bentley’s office Tuesday. 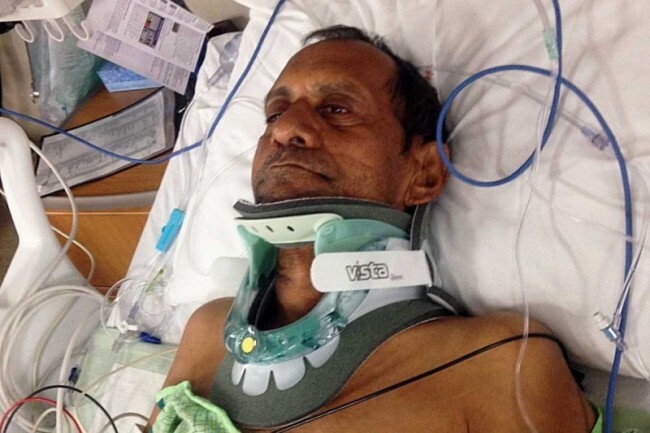 The attack on 57-year-old Patel, who was visiting his son in Madison, was captured on a video camera on a police vehicle. Officer Eric Parker, who responded to a neighbor’s complaint that a “skinny black guy” was loitering around, is seen slamming him to the ground after Patel, who does not speak English, could not answer his questions. Patel is partially paralysed after the attack. Although disdained by many as a socially backward and conservative state, Alabama’s reaction to the racially-charged incident involving a white police officer and a person of colour stands out in contrast to the way recent police attacks on minorities have been handled elsewhere. Bentley took responsibility for the incident, ordered an inquiry and apologised. Officials in Madison dismissed the officer, Eric Parker, filed assault charges against him and arrested him. In New York, a police officer choked an unarmed African American man to death in an incident caught on camera by a passerby. However, he was allowed to stay on the force while grand jury failed to bring charges against him. In Ferguson in Missouri, an African American teenager was shot dead by police and that officer also remained on the force and a grand jury cleared him. The Ferguson case led to several days of rioting by an enraged public. However, Parker also found support among some people who set up crowd-funding initiative for him on Indiegogo.com. It had brought in $3,301 as of Tuesday night. Parker who surrendered at a local jail, and was out on bail, entered a not guilty plea Tuesday, his lawyer Robert Tuten, was quoted in local media. Meanwhile, an Internet fundraiser on Gofundme.com to collect contributions for Patel’s medical treatment has raised $189,102 by Tuesday night against a target of $100,000.